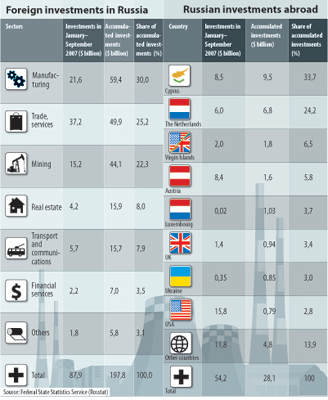 The state statistics service, Rosstat, has released data on foreign investment for January-September 2007. They demonstrate that the mutual exchange of investments between Russia and the rest of the world has grown by more than 50 percent from the previous year, a development that experts believe will be positive for long-term economic growth. Foreigners have invested 150 percent more capital in Russia during January-September 2007 than in the same period in 2006. The bulk of these investments came in the form of loans. Total investments in the reported period amounted to $87.94 billion, of which loans accounted for $57 billion, or 67 percent. The majority of these loans were long-term, which is a strong indicator of continued foreign confidence in the Russian economy. Foreign direct investment (FDI) in production almost doubled, reaching $19.6 billion, while loans accounted for approximately half of that sum ($9.75 billion). Foreigners did not like investing in Russian securities or unit funds. However, portfolio investments grew by nearly 130 percent year-on-year, to $1.55 billion. The bulk of investments, $37 billion, some of them in the form of trade loans, went into the rapidly expanding wholesale and retail trade sectors of the economy. Wholesale and retail firms also borrowed heavily to ensure development, and signed several agreements to sell their assets to foreign companies. Investment in manufacturing reached $21.6 billion, showing foreign companies' interest not only in highly profitable sectors, such as mining (in which they invested more than $15 billion), but also in developing Russia's production capabilities. The leading investors were Cyprus ($39.1 billion), the Netherlands ($36 billion), Luxembourg ($30.3 billion) and the UK ($24.2 billion). However, investments from those three countries came mainly from the offshore structures of Russian companies registered there (i.e., Russian money returning to Russia). According to Rosstat, the state statistics agency, Russian investments abroad totaled $54.2 billion during January-September 2007. This was 56.6 percent more than in the same period in 2006. Accumulated Russian investments abroad amounted to merely $28.1 billion. In other words, the bulk of Russian investments abroad were subsequently repatriated back to Russia. Russian net investments abroad amounted to $13.8 billion by the end of September 2007, compared to $14.3 billion by the end of 2006. This means that the share of direct (as opposed to offshore) investment abroad is growing. However, offshore investments remain substantial: $8.5 billion was invested in Cyprus and nearly $6 billion in the Netherlands during the first three quarters of 2007.